Has the change in the Union government’s cabotage policy been designed to benefit the “string of jewels” in the Adani group and foreign companies at the expense of India’s domestic shipping industry? The new policy appears to smack of neo-colonialism and could lead to the marginalisation of India’s largest government-owned port, the Jawaharlal Nehru Port Trust (JNPT) in Mumbai. A recent notification by the Union Ministry of Shipping has relaxed restrictions on the movement of export-import cargo by foreign ships between and among Indian ports along the country’s coastline. The move could have disastrous consequences for the domestic shipping industry and the country’s economy. This is the biggest-ever change in India’s shipping policy undertaken by the Narendra Modi government and is expected to endow huge benefits to a small clutch of international and domestic shipping companies, including those associated with the Adani group. The loser is likely to be the Jawaharlal Nehru Port Trust. On 21 May, the Ministry of Shipping, Government of India, issued a notification that has relaxed restrictions on the movement of foreign ships engaged in transporting containers laden with goods for export or import as well as empty containers between and among Indian ports along the country’s coastline. This is the latest move in a policy tussle going for many years and appears to tilt the balance in the shipping industry and the ports sector in the country hugely in favour of major multinational shipping lines and private port operators to the detriment of Indian shipping companies and government-run ports. Significantly, the decision is likely to result in major gains for companies in the Adani group which own and operate several private ports in India, which import coal and agricultural products and which have significant interests up and down the logistics value-chain. Shipping goods within India’s domestic jurisdiction, that is, from one Indian port to another, is known as “cabotage.” It is governed in India by the Merchant Shipping Act (MSA) of 1958. Under Section 407 of the Act, only ships registered (or “flagged,” in shipping parlance) in India, which follow Indian laws and pay taxes to the Indian government are permitted to engage in cabotage trades. On the other hand, foreign-flagged ships can transport cargo within the country if they obtain a licence from the Directorate General of Shipping (DGS) in the Union government. These licences are meant to be granted only in when there are no Indian ships available for moving a particular shipment from one port to another. 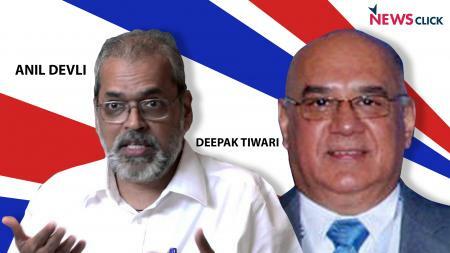 The DGS is supposed to issue a licence in this regard to a foreign ship after it obtains a no-objection certificate (NoC) from the Indian National Shipowners’ Association (INSA), a Mumbai-based trade association and lobby group of domestic shipping companies. On its part, INSA issues a NoC to a foreign ship only if none of its members show an interest in carrying the consignment and/or are willing to match the rates of transportation offered by the foreign ships. Cabotage rules have to be contrasted to rules governing international shipping that apply to the movement of cargo between an Indian port and a foreign port. International shipping is open to all ships, both Indian and foreign. An analogy can be drawn with the airlines sector: only Indian airlines can operate domestic flights carrying passengers within the country, while both Indian and foreign airlines can operate international flights. Through this policy structure Indian ships maintain an effective “right of first refusal” over all coastal shipping that takes place in the country. While the regime may evoke memories of the erstwhile “licence-control raj” it is in fact in line with, and in complete consonance with, international practices that are in place in comparable trade-dependent countries with long coastlines, including the United States and China. The reason coastal shipping is particularly significant is the practice of “trans-shipment.” In the world of shipping, trans-shipment is one of the principal methods used by shipping firms to improve efficiency and profit margins. Trans-shipping refers to the aggregation of cargo from several different locations at one port, or vice-versa. It is to some extent inevitable because of the different sizes of vessels owned by shipping lines and the large variations in traffic flows generated at different ports in the same region. A large ship operating between continents usually does not find it feasible to dock at different ports in one region to pick up small amounts of cargo. Instead, a shipping firm can arrange for smaller ships, called feeders, to trans-ship cargo from different locations to one “hub” port, where the mainline ship, often a massive vessel, can pick up the aggregated cargo. Similarly, a mainline carrier bringing cargo for different locations in one region can offload them at a hub where feeders can pick up cargo meant for different final destinations. Container shipping lines, hence, sub-contract this job to a fleet of smaller feeder ships to aggregate and distribute cargo to different ports in a region. Foreign container lines typically own foreign-flagged feeder vessels. An important point to note is that while trans-shipment is a revenue-earning source for a shipping company, it adds to costs of the importer and the importing nation due to additional handling charges and deviations in routes. Under the previous policy regime, foreign shipping lines were not permitted to operate their feeder ships along India’s coastline. The effective consequence was that most container lines servicing India chose to use nearby foreign ports and trans-ship cargo destined for India on their foreign-flagged feeder ships, thereby not violating the restrictions on cabotage. 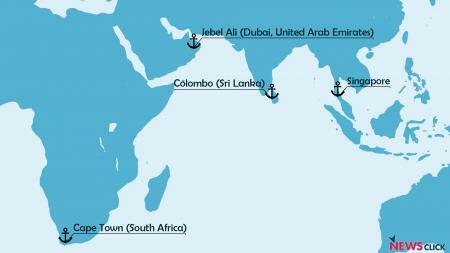 Typically, the Colombo Port in Sri Lanka, the Jebel Ali Port in Dubai in the United Arab Emirates, and the Singapore Port act as important trans-shipment hubs for Indian cargo, with the three locations respectively servicing the international shipping routes from Cape Town, South Africa, through the Suez Canal, and to (and from) China and other South-East Asian countries. Roughly two-thirds of Indian container trans-shipment, amounting to approximately 2.2 million TEUs (or twenty-foot equivalent units – a measure used in shipping), takes place from these ports at present. According to the government’s reasoning as laid out in the notification, this will promote trans-shipment along India’s coast and lead to the development of certain Indian ports into trans-shipment hubs. In effect, however, the result could be just the opposite. The policy change is expected to result in a major shift in the balance of cargo – away from Indian shipping companies to foreign ships, and from government-run ports to private ports. This is primarily on account of the manner in which certain multinational shipping lines and one major Indian player – the Adani group – have positioned themselves in the shipping and ports sectors, as we shall explain later in this article. In the criss-crossing of interests of the various stakeholders involved – Indian shipping companies, foreign shipping companies, government-run ports, private ports as well as various manufacturing and trading bodies who form the clientele of the shipping industry – alongside the need to balance national security considerations, there has in the recent past been intense lobbying by various groups both for and against the relaxation of cabotage restrictions. There has consequently been a series of false starts and flip-flops in government policy. Incidentally, the Union Ministry of Shipping is headed by Nitin Gadkari and its senior-most bureaucrat is its current Secretary Gopal Krishna. The demand to relax cabotage is not new. Most foreign shipping lines and their Indian clients have always sought an across-the-board relaxation of the restrictions in view of the “massive” market that it would supposedly open up. During the tenure of the previous Congress party-led United Progressive Alliance government, a proposal to relax cabotage restrictions had been floated by the Shipping Ministry in 2012. Following representations by various lobby groups, INSA had, under a direction from the ministry sought a legal opinion on the issue from the Senior Advocate and former Attorney General of India Soli Sorabjee. Murmurs about an impending “absolute” cabotage relaxation started circulating soon after the Narendra Modi government came to power in May 2014. Reports in the business press indicated that easing cabotage rules was among the earliest agenda points for the Shipping Ministry under its new industry-friendly minister Gadkari. A report in The Hindu Business Line of 15 June 2014 stated that the new government had already spent “a couple of weeks” meeting “stakeholders” who wanted cabotage rules relaxed. The position was consistent with a view that Prime Minister Modi had apparently supported when he was Chief Minister of Gujarat. Under his tenure, the Gujarat Maritime Board, the state’s ports regulator, had demanded relaxation of cabotage rules. The board sent another representation to the same effect after Modi took over as Prime Minister, according to a report in the Mint. The CLSA submitted that Indian shipping firms paid an average tax rate of 9.7 per cent compared to the rate of 2.2 per cent paid by firms registered in Singapore. It also pointed to the fact that Indian laws and regulations were such as to place a higher cost burden on domestic shipping firms in contrast with their counterparts in other countries. For instance, Indian rules mandatory require a relatively higher number of Indian personnel to be in the crew of a ship, a restriction that many other countries do not have. Owners of Indian ships pay goods and services tax (GST) which foreign shipowners do not. In addition, domestic shipowners pay at least 15-20 per cent more when purchasing fuel. In addition, Indian banks charge a much higher rate of interest for finance, typically nine per cent per annum or more, compared to foreign banks whose interest rates can be as low as two per cent. Thus, the CLSA contends that Indian-flagged ships are much more costly to maintain and hence, its members choose to use foreign-flagged feeders to trans-ship goods from other countries to save costs. The lobby has been arguing that if cabotage restrictions are eased, it would make transportation charges nearly 45 per cent cheaper for users and would help the country’s businesses save as much as US$100 million (or around ₹680 crore at current exchange rates) every year. On the other side of the fence, an industry source indicated to the authors that in a meeting at the PMO shortly after Modi assumed power, the Principal Secretary to the Prime Minister Nripendra Mishra backed the demand of the INSA to create a level-playing field for Indian shipping companies to enable them to effectively compete with foreign players. As a result, Indian container ships were exempt from paying taxes on fuel. Following this move, the domestic shipping sector began to attract foreign investment for the first time since 2001 when the government allowed foreign investment in shipping. On 3 July 2015, the Shipping Ministry’s Coastal Shipping Cell put out an office memorandum seeking comments from the public on a draft policy note proposing to ease cabotage restrictions. The 19-page note summarises the positions taken by the CSLA and the INSA besides those of the government agencies. However, in its conclusions, the draft policy was not convinced about the need for, and efficacy of, a full relaxation of cabotage regulations. “There did not seem to be a convincing argument in favour of uniform relaxation of cabotage restriction for [container cargo] along the entire Indian coast,” the draft policy note stated. Instead, it said that “at best” this could be allowed on the east coast of India since container traffic at ports on the eastern coastline tended to be trans-shipped while ports located along the west coast usually received “gateway calls” – meaning that containers were directly loaded on (or off) mainline ships. The draft policy note then proposed to ease cabotage rules for ports situated along the eastern coastline between Kolkata and Chennai, and also sought to relax cabotage rules for special vessels that were not available with Indian shippers, such as over-dimensional cargo carriers, car and truck carriers and Liquefied Natural Gas (LNG)-carrying vessels. A month after issuing this note, in August 2015, the Shipping Ministry dropped the proposal to relax cabotage rules for ports on the east coast and went ahead with allowing foreign vehicle carriers to ply between Indian coasts. But this was perceived more as a formality than a move towards easing cabotage rules, since there are no specialised vessels registered in India. Then, in 2017, in a communication from the PMO, the Shipping Ministry was asked to find the answers to two specific questions and implement solutions. First, the ministry was tasked with finding out how foreign shipping lines could be encouraged to register vessels in India. Second, the ministry was asked to seek ways to reduce the operating costs of Indian ships vis-a-vis foreign flagged vessels. Importantly, the communication from the PMO also pointed out that the secretariat of the National Security Council had expressed concern that the proportion of Indian trade carried by Indian ships/flagships has come down from around 42 per cent in the 1990s to less than eight per cent at present. It is against this backdrop that the 21 May notification has to be viewed. On the face of it, the new notification constitutes another about-turn by the government. By opening up coastal trans-shipment to foreign shipping lines, there is no longer an incentive for them to register their ships in India or employ and train Indian seafarers or to invest in Indian shipping companies. Indian shipping companies will find it impossible to match the tariff rates and scale of operations of foreign companies. What will be the outcome? There will be a shift in the transportation of export-import cargo from Indian ships to foreign ships. The notification permits foreign shipping companies to operate services on par with Indian ships – that is, they now have the ability to call at every port in India. However, such vessels will not pay any tax to the Indian government on income earned and will not be subject to the condition (that are applicable to Indian shipping companies) of hiring Indian crew and officers and training Indian cadets. These vessels would enjoy the benefits of lower costs of bunker fuel – a generic term used to describe fuel that drives a ship – and diesel oil used on board, thereby significantly lowering their operating costs. The lower operating costs thus make it difficult for Indian vessels to match the rates of the foreign flag ships resulting in Indian shipping companies going in for an easy option – migrate existing tonnage away from Indian-flagged ships and make further investments only in non-Indian-flagged ships. This could ultimately lead to a scenario where a lack of Indian ships involved in carrying export-import cargo could expose Indian clients of shipping companies to “predatory pricing” by foreign players – predatory pricing by a company is the pricing of goods or services at such a low level that it results in competing firms being forced to shut operations and leave the market. In this instance, those who engage in predatory pricing would typically lower freight rates drastically and force its competitors (Indian flagships) to match the rates. These rates would unremunerative for Indian shipping firms resulting in them closing their operations leaving the field free for foreign flagships to raise freight rates. Whereas many may argue that this is indeed the rules of the market and inevitable, the consequences for the country are also clear: costlier imports and more expensive exports making the country’s foreign trade less competitive for all Indian players. However, this picture is incomplete without including the role of several private Indian ports and shipping companies in the lobbying that has gone on – this is where companies in the Adani group come in. In geopolitics, “string of pearls” is a theory used to describe China’s strategy of developing port facilities along the coast from the Chinese mainland to Sudan. China has never officially accepted this theory but many strategists and geo-political observers argue that the fifteen-odd military and commercial facilities (that resemble a string of pearls) help China capture individual markets and control “choke points” on shipping routes resulting in that country having greater control over shipping in the Indian Ocean. Adani Ports is India's largest operator of ports in the private sector. 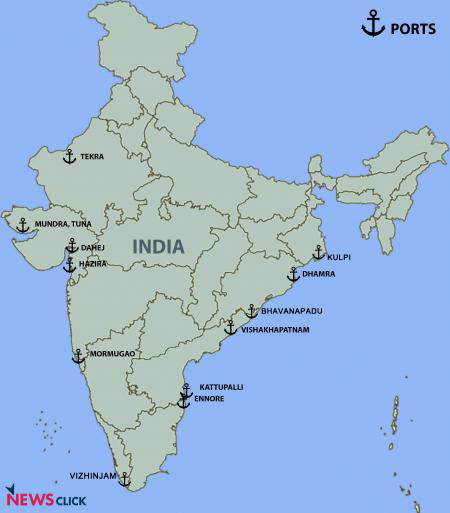 It controls the activities of nine ports located along the country's western and eastern coastlines – Mundra, Tuna-Tekra, Dahej, Hazira (all in Gujarat), Mormugao (Goa), Ennore, Kattupalli (both in Tamil Nadu), Vishakhapatnam (Andhra Pradesh) and Dhamra (Odisha). The list is set to increase with the inclusion of Vizhinjam port in Kerala which is under construction. The Adani group has been awarded the contract to build the Bhavanapadu port in Andhra Pradesh and the group has proposed to build the Kulpi port in West Bengal as well. Through these ports, cargo from several major industrial regions are captured according to their location. Mundra, the largest multi-commodity port in the country attracts traffic from New Delhi, Gujarat and parts of Maharashtra, while several smaller commodity-specific port operations like the group’s coal terminal in Mormugao, Goa, serve the coal needs of steel-making plants in northern Karnataka. The main competitors of Adani Ports – government-run “major ports” – often lose business on account of the former’s reported efficiencies, deployment of better technology and lower tariffs. 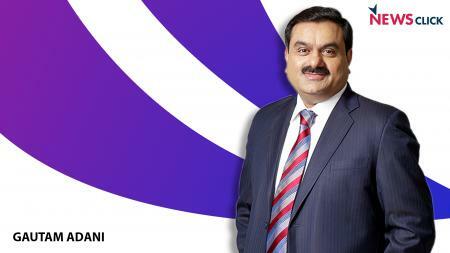 The Adani group benefits from the growth of business in each port. However, with the easing of cabotage restrictions on foreign ships, the ports could help one another grow and at the expense of the major ports in the public sector. This is because of the partnerships that Adani Ports have entered into with major international shipping lines. In June 2013, Switzerland-based Mediterranean Shipping Company (MSC), which is the world’s second largest container-shipping company, entered into a joint venture with Adani Ports and Special Economic Zones (APSEZ) to form Adani International Container Limited (AICT), which would operate the third container terminal at the Mundra port with an annual capacity of almost 1.5 million TEUs. At the time, Mundra had two operational container terminals, one operated by APSEZ and the other by Dubai-based DP World. A year later, in July 2014, APSEZ signed another deal for a container terminal, this time with the French company CMA-CGM which is the third largest container shipping company in the world. The joint venture, Adani CMA Terminal Private Limited, was to operate another container terminal at Mundra with an annual capacity of 1.3 TEUs. While this fourth terminal was under construction, the Adani-MSC venture announced that it would double its handling capacity to over 3 million TEUs per year. Together then, the four terminals would make Mundra the biggest container port in the country, with a total capacity of 6.6 million TEUs, leaving behind the government run Jawaharlal Nehru Port Trust (JNPT) in Mumbai which has a capacity of a little over 4 million TEUs a year. These investments follow a global pattern of large container shipping lines investing in port terminals. Despite the large initial outlay, owning a terminal is of tremendous benefit to shipping companies. It ensures that their ships get first priority for berthing and also cuts down on payments of port-related charges. Both MSC and CMA-CGM were already the biggest container customers at the Mundra port, but their significant new investments could only be justified by a substantial increase in traffic. Container cargo consists of manufactured goods and traffic that are generated from industrialised regions. In India, traffic originates mainly from the northern and western industrialised states with some demand from southern states. Mundra, with its competitive pricing and better infrastructure and connectivity, has already begun attracting traffic from the north and west regions. By partnering the Adani group, companies engaged in trade using ships stand to gain from using the company’s inland container infrastructure in north India. APSEZ's subsidiary Adani Logistics Limited currently runs three inland container depots (ICD) at Patli (in Haryana), Kishangarh (Rajasthan) and Kila Raipur (Punjab). The Punjab ICD is a part of an multimodal logistics park developed by Adani Logistics and is located on a special freight rail line to Mundra which was “dedicated to the nation” in April 2017 by the then Union Railways Minister Suresh Prabhu. That’s not all. According to shipping industry insiders, the container lines also hope to make their Mundra terminals a hub for all container traffic from west and north India. This would mean not just cornering more and more traffic from where it originates, but also diverting traffic from competing ports servicing the region, specifically, the government-owned JNPT in Mumbai which is India’s biggest container port handling around 40 per cent of the country’s total container traffic. Killing Jawaharlal Nehru Port Slowly? While most major container lines visiting western India call at both ports, JNPT and Mundra, this is expensive compared to using a feeder ship to ferry cargo from JNPT to Mundra. The feeders, being smaller ships, pay almost a quarter of what mainline ships pay port authorities for berthing. Moreover, congestion at JNPT can lead to delays for mainline vessels, which ply on scheduled routes. If feeder operations are planned well, they could transfer containers from JNPT to Mundra necessitating only one stop in the subcontinent by mainline vessels. Relaxing cabotage would thus eliminate the need for such ships to call at JNPT at all, although that would mean a major loss of revenue for the port. The port authorities are understood to have written to the Shipping Ministry voicing their apprehensions over the transfer of cargo to Mundra. In fact, the Deputy Chairman of JNPT Neeraj Bansal had publicly shared concerns over the future of JNPT if cabotage rules are relaxed. 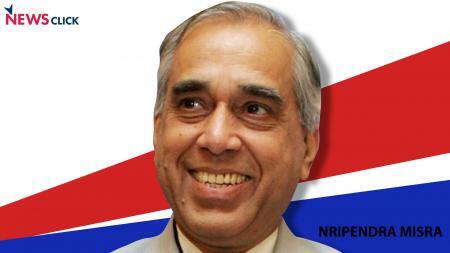 A source claimed that JNPT officials have been told not to share their concerns in this regard with the media. It is in this context that the 21 May Shipping Ministry notification has to be looked at. With the restriction on cabotage by foreign ships lifted, international shipping lines are free to restrict themselves to making only one call at the Mundra port, where the same companies enjoy the benefits of owning the terminals as well. Therefore, they can now use their own foreign flagged ships to trans-ship cargo to and from other Indian ports. Indeed, one of the stated goals of MSC’s terminal at Mundra is to be a trans-shipment hub for the Middle East, South Asia and India, something it cannot achieve without a relaxation in cabotage rules. Adani Ports and Special Economic Zone (APSEZ), with its fingers in more than one pie, would also welcome such a policy. The group’s under-construction port at Vizhinjam, Kerala, is stated to be India’s largest container trans-shipment hub and is meant to compete with Colombo. “With liberal use of foreign vessels for trans-shipment, the ports get an opportunity to attract more trans-shipment cargo. The Adani group, with a chain of container terminals, would certainly benefit,” a former Secretary to the Ministry of Shipping told one of the authors of this article on condition of anonymity. Not surprisingly, APSEZ has led calls for relaxation of cabotage restrictions. “Of late, the anti-cabotage lobby has become stronger with large private ports and foreign terminal operators joining hands with shippers and the Government-owned ports,” the June 2014 article in The Hindu Business Line quoted earlierhad stated. The Mint reported that the relaxation had become “necessary” for a new terminal at Adani’s Mundra port that was to be operated by MSC, which wants to run the berth as a trans-shipment terminal. This can “only succeed” if cabotage rules were relaxed, the report said quoting an unnamed shipping industry executive. 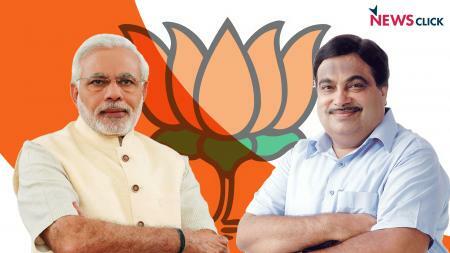 Adani’s proposed port at Vizhinjam, Kerala, too had demanded easing cabotage, the report added. INSA expresses its deep disappointment at the dilution of Section 407 of the Merchant Shipping Act 1958 which would have disastrous consequences on Indian trade, Indian economy and also Indian flag ships. Given that transportation of containers on the Indian flag vessels is the fastest growing shipping segment in Indian shipping with a 20% CAGR in tonnage growth from FY14 to FY18, the fact that Indian shipping companies carry about 1.5 million TEUs of cargo between Indian ports and yet have unutilised capacity of about 4 million TEUs per year makes the decision of the Ministry of Shipping clearly inexplicable. The Indian shipping industry had, in response to the directions of the PMO, responded with great enthusiasm by pouring investment in the Indian flag. Through this Order the Ministry of Shipping has handed over to the foreign flag vessels the control over the movement of containerised cargo on the coast of India. The economic and strategic impact of this decision would only be seen in the coming years. That this move would lead to diversion of cargo from the tax paying Indian flag vessel to the non-tax contributing foreign flag vessels; lead to diversion of cargo from government ports to private terminals which do not fall under the purview of TAMP [Tariff Authority for Major Ports] and will impact the cost of movement of our EXIM containers, in due course, is a certainty. The absence of the Indian flag which has always had a sobering impact of price of services will most certainly lead to an increase in the logistics cost for the Indian trade which could manifest itself overtly or covertly, as was the case in respect of the findings of the Committee constituted by the Ministry of Shipping on transparency on costs. Whether this will actually lead to creation of transhipment hubs at Indian ports is not certain but the cost to the Indian flag industry, the Indian seafarer, the Indian cadet and the Indian economy is something that will have to be immediately borne. With this order the Ministry of Shipping has made superfluous the need for a National Flag vessel for transportation of containers on the coast. This could well lead Indian companies to examine the option of switching to a flag which offers lower operating costs coupled with unfettered access to Indian cargo. A shipping source who spoke to one of the authors of the article on condition of anonymity estimated the likely gains to Indian ports on account of additional trans-shipment business to be in the region of over $168 million per year (or over₹1,000 crore). The same source added that in comparison to this gain, the overall losses to the country’s economy on account of the 21 May change in cabotage rules could be many times higher. On 21 May 2018, the Ministry of Shipping, Government of India, issued General Order No. 1 of 2018 (Notification SW-1 5011/2/2016-MG). Under the notification, foreign flag-ships are exempt from Section 407 of the Merchant Shipping Act, 1958, when they are engaged in coastal shipping between Indian ports of EXIM (export-import) laden container cargo or empty container cargo. 1) There is a view that if Section 407 of the Act is done away with, it would lead to cannibalization of cargo from government ports to non-major ports. What are your views? 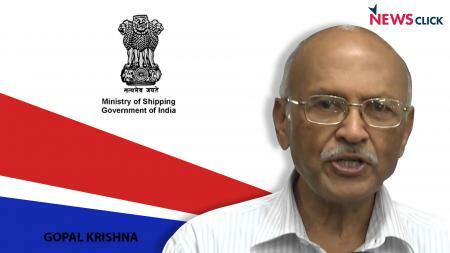 2) In 2017, the Prime Minister’s Office had asked that in national interest the Ministry of Shipping should (a) get shipping companies with foreign flags to register in India, and (b) take measures to reduce the operating costs of Indian flagships to enable them to compete more effectively with foreign flagships operating along the country’s coast. What has your Ministry done to fulfil these two objectives? Does the notification of 21 May not contradict the stated objective indicated in part (a) of the PMO’s directive? 3) It has been argued that the relaxation of licensing provisions under Section 407 of the MSA will be in direct conflict to the directions of the PMO to the Ministry of Shipping. What are your views? 4) The secretariat of the National Security Council has expressed concern that the proportion of Indian trade carried by Indian ships/Indian flagships has come down from around 42 per cent in the 1990s to less than eight per cent at present and reportedly argued that this is not good for the country’s strategic interests. What has the Ministry of Shipping done to check the reduction in the market share of Indian ships in the carriage of cargo that is considered critical for the country, such as crude oil, food, coal and cement? 5)The Public Procurement (Preference to Make in India) Order of the Department of Industrial Policy and Promotion (DIPP) dated 15 June 2017 clearly states that local content should be increased in the procurement of goods and services from Indian companies. The order has named the Ministry of Shipping as one of the nodal agencies to implement this policy directive. What has your Ministry done to give effect to this policy directive of the DIPP? 6) How does your Ministry’s proposal to dilute licensing rules to permit foreign flag vessels to carry out coastal voyages without the need to obtain a licence help in achieving the policy directive? It can be argued that your Ministry’s proposal would act to the contrary. Your views are solicited. 7) The Seafarers’ Rights International, an international independent centre backed by the International Maritime Organisation and the International Labour Organisation (ILO) among others, published a long-term study in 2017 which stated that at least 91 countries across the world maintain some form of maritime cabotage law as it promotes shipboard and environmental safety, promotes national security and creates jobs. It has been argued that the policies espoused by the Ministry of Shipping will work in a reverse direction by not promoting Indian flag shipping which would create jobs for Indian seafarers. What are your views in this regard? 8) In March 2016, a notification issued by your Ministry (Notification SW-15011/8/2015-CS) exempted a terminal from the provisions of Section 407(1) of the MSA. Under the new notification this previous notification has been over-written. In the interim period, how many ports have sought relaxation of cabotage rules for their container handling terminals? Is it correct that none of the non-major ports or ports operated by affiliates of foreign container lines availed of this benefit? Would it be correct to presume that non-major container ports did not avail this benefit since they did not wish to take responsibility for ensuring trans-shipment of containers over their ports? 9) Would diluting the licensing provisions of Section 407 of the MSA result in Indian flag ships flagging out of India as the “right of first refusal” is a major–if not the only–incentive for such ships to remain flagged in India? 10) It is contended that a dilution of Section 407 of the MSA could result in a large number of the 200,000-odd seafarers in India losing their jobs and access to training facilities. Do you agree? 11) There is a view that a dilution of Section 407 of the MSA would significantly weaken the Indian shipping industry which contributes an estimated Rs 8,000 crore a year to the government by way of various taxes. This, in turn, would result in a substantial lowering of revenue collections. Do you agree? According to the Union Ministry of Shipping’s General Order No. 1 notified on 21 May 2018, the Government of India has relaxed the provisions of Section 407 of the Merchant Shipping Act, 1958, also referred to as “cabotage restrictions” or “cabotage rules” or “cabotage law.” According to the notification, foreign-flagged ships are permitted to engage in coastal shipping of EXIM (export/import) cargo and empty containers between Indian ports. In this regard I seek your responses and/or comments on the following questions. 1) What is your company’s (meaning Adani Ports and Special Economic Zone or APSEZ) position on the 21 May revision in the cabotage law? 2) Various stakeholders in the shipping industry claim that APSEZ has been lobbying the central government to relax cabotage rules across India. Your comments? 3) Have your partners, including Mediterranean Shipping Company (MSC), CMA-CGM and DP World, sought your help in representing to the Union government an easing of the cabotage law? 4) What are APSEZ’s revenue projections after the relaxation of cabotage rules? 5) Is it correct that APSEZ and the Kerala state government on behalf of APSEZ have lobbied the Union Ministry of Shipping to relax cabotage restrictions in order to boost the under-construction Vizinjham Port in Kerala as a trans-shipment hub? 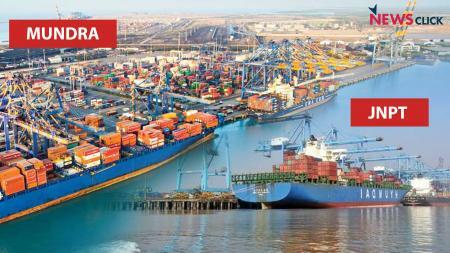 6) Is it correct that the partnership between APSEZ and MSC intends to develop the Mundra port as a transshipment hub? There was no response to the questionnaires till the time of publication on 25 May. This article will be updated as and when we receive their responses.